Introducing a "tourism tax" for Hull has been branded a "very poor" idea that "sends out the wrong message". 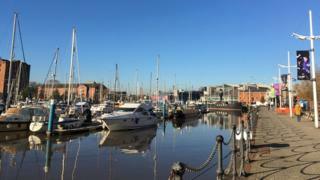 Hull City Council is to conduct a feasibility study into the prospect of levying a charge on visitors. Travel writer Simon Calder said it would put people off spending time in the City of Culture. The authority, which spends £90,000 a year on tourism marketing, said it was "purely an information gathering process" at this stage. However, councillor Mike Ross expressed concerns. "We're at the early stages of getting people to come and visit the city as it is. "[My] fear is that anything like this just sends out the wrong message to people across the country," he said. Paul Vinsen, chairman of Hull and East Yorkshire Hospitality Association, said it would undo the success of the city's year as culture capital. "I think it's a very poor idea and I don't think it will work," he said. "City of Culture has been incredibly successful... and all that good work will go to nothing because when [visitors] come to return they'll find it more expensive." Tourist tax is levied on visitors to the USA and a number of European countries including Spain, Italy, Belgium and Austria. Earlier this year, a tax on tourists had been suggested by councillors in Bath as a way of raising money for the city. Mr Calder said a tourist tax for Hull would be "a disincentive" for the city. "You have to make an effort to go to Hull. It's not yet on the tourist trail in the same way that, say, York is." In a statement, the council said: "At this moment this is purely an information gathering process. "It is good practice for councils to look regularly at ideas that other cities in the UK are considering as part of developing their tourism industry. "Any relevant information collected will be discussed with partners before any proposals for implementation are presented. "All final decisions will be taken by the council's cabinet, no decision has been made." Imposing any tax would require government approval of a new legislation before it can be introduced by a council.